This history is excerpted from The History of Cherokee County by Rev. Lloyd G. Marlin, Cherokee County Historian, and former Superintendent of Holly Springs Schools. The book was originally published in 1832 by Walter W. Brown Publishing Co. in Atlanta, Georgia, as “a part of the statewide preparation being made for Georgia’s Bicentennial Celebration in 1933”. Recently reprinted by the Cherokee County Historical Society in Canton, the book is for sale. Visit the Society’s website for more information. One of Ball Ground’s largest houses, originally constructed in the mid-1800s and enlarged around 1900. Unusual eclectic style encompassing ‘plantation plain’, Victorian and Classical elements—all a reflection of the historical development of the property between 1855 and 1932. On the National Register of Historic Properties. “Contributing their own share in the development of Cherokee County are four incorporated towns besides Canton: Ball Ground, Woodstock, Holly Springs, and Waleska. The first three, situated on the line of the Louisville & Nashville Railroad, which runs north and south through the county, and also on the arterial State Highway No. 5, have drawn much of their growth from the presence of excellent transportational facilities. All of these towns are peopled with enterprising citizens, and are, if hardly frenzied centers of trade and industry, at least thriving, progressive communties from which trade and industry are by no means lacking. Each has an individual character, drawn from the advantages of its particular environment and from the nature of the part which it plays in the economic life of Cherokee County. And each has its record of participation in the history of the county. Ball Ground, the largest of these four places, is a substantial town of eight hundred or more inhahitants, and is situated eleven miles north and slightly east of Canton. It is the northernmost town in Cherokee County, although a small portion of Nelson, three miles farther up the highway, extends from Pickens County into Cherokee. 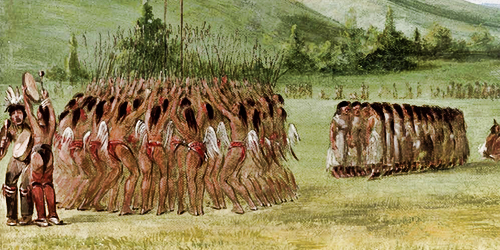 The name of Ball Ground is a survival of Indian days, when the site of the present town was used by the Cherokees for their national pastime, the ball-play. The several hills on which the town is built sweep up from a broad level space to the south, probably the identical tract on which the Cherokees won a game of ball from their southern neighbors, the Creeks, for the prize of a thousand square miles of land. Although its name has always been applied to the immediate locality, Ball Ground did not come into existence as a town until the railroad passed through it in 1882. Its development up to that year consisted mainly of two country stores and half a dozen dwellings. The community was almost purely agricultural. 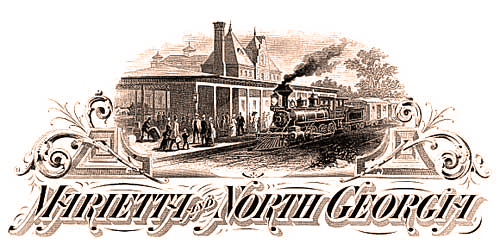 When the survey of the Marietta & North Georgia line was run through Ball Ground in 1882, the officials of the road decided to put up a depot there and start a town to go along with it. Land for a townsite was contributed to the railroad by landowners of the vicinity, whose deed of transfer stated that “The consideration moving each of us in the establishing of this town is the enhanced value to our lands within and adjacent to the said town, and the general benefit to the country, by which we shall be benefited.” Those who donated land were Sarah E. Carpenter, Martha Carpenter, J.W. Byers, P.H. Lyon, F.M. Waldrup, A.M.F. Hawkins, Ancil Bearden, F.M. Waldrup, Ellen Byers, J.C. Carpenter, N.A. Lyon, Hester A. Byers, Berty Carpenter. The railroad officials laid this land off into town lots and held a sale of them in April, 1882. Nearly all the lots were disposed of at once, and the town immediately began to build up. Within two years Ball Ground had an estimated population of 259, a large number of new buildings, three church organizations, a high school, a charter (from the fall term of the legislature of 1882), and a complete set of municipal officers. The incorporators of the town were W.A. Hayes, W.J. Boling, Captain Patterson H. Lyon, M.G. Bates, and J.A. Byers. The first officers of Ball Ground, elected in January 1884, were: Captain Patterson H. Lyon, Mayor; Dr. A.M.F. Hawkins, W.A. Hayes, R.J. Boling, and J.H. Kilby, Councilmen; J.N. Percell, Marshal. A new charter was obtained for Ball Ground in 1911 extending its corporate powers, providing for public schools, and otherwise bringing the town up to date. Ball Ground has always been considered as one of the best business points on the railroad. In addition to providing a market for nearby agricultural sections, it has a number of well-developed industries, such as ginning, saw-milling, and wood-working. The main industry in Ball Ground for a number of years, however, and the one for which it is best known, is the marble-working industry. Three sizeable concerns operate in this industry, the Consumers Monument Company, the Roberts Marble Company, and the Ball Ground Monument Company. Manufactured from marble quaried at Tate, Georgia, the products of these companies are widely known and used.